After I turned in my “last” draft to Michelle (is any draft the last, really? ), I finally sat down and read two authors that she had repped at her previous agency. CRASH INTO ME by Albert Borris and NOTHING LIKE YOU by Lauren Strasnick. It’s been a long time since I’ve read what’s out there in the YA world and I was blown away. CRASH INTO ME is about 4 suicidal teenagers who make a suicide pact to travel where celebrities died and then to kill themselves at the end of the road trip. Beautifully written, told with IM messages, lists, and present-day convcrsations, the book is a can’t-put-me-down. I seriously couldn’t. And the cover really says it all once the narrator reveals the meaning of the snake on his arm. 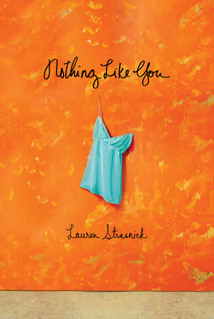 NOTHING LIKE YOU by Lauren Strasnick is totally different than CRASH INTO ME but still equally as gripping. Holly’s mother has recently died and the book opens when she hooks up with Paul. Holly thinks it’s a one-night stand that suddenly becomes all consuming. Paul has a girlfriend and Holly becomes friends with her. What I love about NOTHING LIKE YOU is how real Holly is and how every girl can relate to the guy who has a girlfriend but you love anyway. The relationships in this book are so real. UPDATE: Lauren was gracious enough to put together a list of her fave YA books for me via Twitter. You can follow her @laurenstrasnick. So after I quickly finished those books, I turned to my fellow YA authors on Twitter and asked for their recommendations of what I should read next. Here are their picks. Please add your own in the comments section. Elana Johnson, my fellow agency sister, repped by the lovely by Michelle Andelman of Lynn C. Franklin Associates, Ltd. Follow Elana on Twitter @elanaj. LOVED When You Reach Me! Brilliant. I echo Sarah Zarr. I loved STORY OF A GIRL. Very moving. I need to read both Crash Into Me and Nothing Like You. I went a little lighter and am reading Suite Scarlett by Maureen Johnson and Just One Wish by Janette Rallison. So far, so good. But on the paranormal side, have you read Prophecy of the Sisters by Michelle Zink?? LOVE it. I agree with Shari and Elana. Sarah Zarr is a wonderful writer – “Once Was Lost” is fabulous. Sarah Dessen has never let me down. If you’ve never read her, you really should! Some of these might not be out – I get ARCs through work, but they should be publishing sometime this year. I second the Sarah Dessen recommendation! My fave of hers is The Truth About Forever. I credit that book with getting me hooked on YA. Shari, will totally read Sarah Zarr now since 3 of you say she’s wonderful. Now I have a great list to go through. There is something so nice about having a go-to list of what to read! Thanks for the suggestions! I’ll check out infloox.